We have combined our Time/Speed/Distance computer with our Traffic Pattern Orientator. The 2-in-1 computer is more convenient and easier to use. All a pilot has to do is dial in the runway in use and - voila! - the headings of all legs of the traffic pattern are immediately displayed in the various windows of the computer, including the entry leg. Data are available for both left and right traffic patterns. Pilots are provided with an instant view of the runway and the traffic pattern, an easy and foolproof way to become and remain oriented. Ever have trouble trying to figure out how to enter a traffic pattern when approaching the airport from various directions? Such problems will be gone forever. 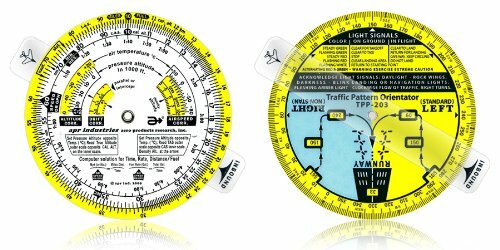 APR's traffic-pattern orientator does exactly what its name implies. It orients the pilot with respect to the runway of intended use. Also provided is a handy table of light signals in the event of radio failure. (Perhaps you can't remember them in a pinch; who can?) On the flip side is APR's popular TIME/SPEED/DISTANCE COMPUTER. It includes all the features and functions you've come to expect from a high-end computer. APR has even included a temperature-rise scale for when you graduate into faster aircraft and need to correct indicated temperature for compression. Time/Speed/Distance computer combined with Traffic Pattern Orientator. Instant view of the runway and the traffic pattern. Easy and foolproof way to become and remain oriented. Includes a handy table of light signals in the event of radio failure.